Is Your Dog Overweight - Recognizing the problem & what you do about It! Recognizing the Problem and Doing Something About It! The New Year brings a time for both reflection and planning. New Year’s resolutions are often made and one of the most popular of these is to lose weight and get in shape. What about your dog? Is Your Dog Overweight? While you get in shape your dogs can too. Obesity is one of the most common problems seen in dogs. Canine Obesity can cause a lot of other health problems. Like humans, obesity dramatically shortens your dog’s life. It is just as deadly to your dog as well. The health risks in overweight dogs are much the same as they are in humans. Reducing these risks can be as simple as adding exercise and feeding a better diet. A simple visit to your Veterinarian is all it takes to begin the journey back to better canine health. 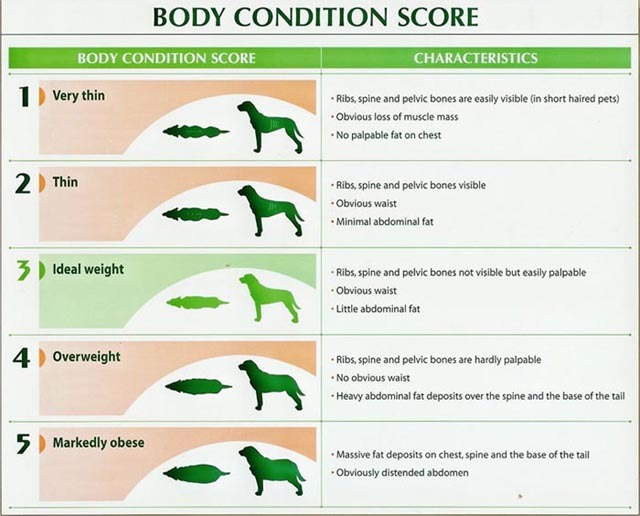 Veterinarians use a point system to evaluate the body condition of pets. A value of one means the dog is extremely thin to the point of being emaciated. A value of five means your dog is grossly overweight. Dogs are considered to be normal if they receive a score of three. To determine body score, several specific areas of the dog are examined. You should be able to feel your dog’s ribs when you run your hand over your dog’s side. There should be a small layer fat over them but only enough so that you can’t see them. Each rib should be distinct with a small amount of pressure. If you can see the ribs when your dog is at rest, your dog is too thin. If you can’t feel them at all, the pet is overweight. As with the ribs, you should be able to feel a small amount of fat over these areas. If any of these areas are easily felt or seen, the dog is too thin. If you can’t feel the bones beneath a thin but firm layer of fat, your dog is obviously overweight. From above, your dog should have an easily defined waistline behind the ribs. Your dog is too thin if its waistline is extreme, or if you can see the ribs, spine or hipbones. If your dog has no visible waistline it is overweight. A dog is considered extremely overweight if the area between the ribs and hips is wider than the hips or ribs. Your dog should have a very visible abdominal tuck when viewed from the side. This means the area behind the ribs should be smaller in diameter than the chest. This will vary from breed to breed because some breeds have a deeper chest than some others. (Pointers have a much deeper chest than a Husky or a Dachshund). A dog that is overweight will have no abdominal tuck or have a visible belly. Consult your veterinarian if you think your dog might be overweight. Your veterinarian will be able to determine if there are any other medical problems before you begin a diet or weight reduction program. Your veterinarian will also be able to suggest various diets, exercise regimes and advise you about how fast your dog should lose weight. 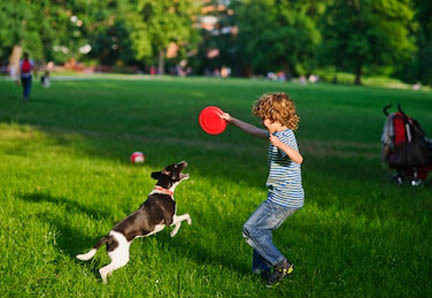 If you need help teaching your dog any behavior you can contact us and we can give personal instruction. Contact Us.